Pumps and plungers are an integral part of industrial fluid handling lines and any fault in them can automatically translate into a production outage. 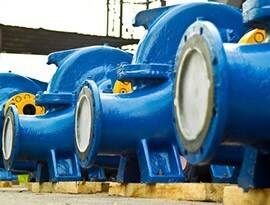 Pump components are also more susceptible to corrosion and wear since they bear considerable abrasion. A&A’s coatings are capable of restoring these worn and corroded areas to original specification sizes while also offering value added properties such as wear and corrosion resistance. When corrosion and wear resistant coatings are sprayed on impellers, covers, casings and face plates, a remarkable extension in life of the components is noted. Materials such as chromium oxide ceramic, tungsten carbide, chromium carbide and others are used to achieve this solution. Worn bearing areas and seal areas can be coated, ground and/or machined back to original print dimension. If a hard coating material such as ceramic or carbide is used for these repairs the shafts will last significantly longer than they did originally in an uncoated state. Areas of Pump Plungers which are susceptible to wear and corrosion are coated with corrosion and wear resistant like tungsten carbide and ceramics in order to provide protection and extend service life. At A&A Coatings, we now have over 70 years of experience dealing with some of the most challenging coating solutions to facilitate pump repair. The parts noted above are only sampling of what we can coat. From pump casings to wear rings to flanges to pistons, we are able to re-coat your pump components indefinitely so that your pumps can operate for longer without the need to replace them. Let us help you save on the costly pump replacement costs via our superior coating solutions – give us a call today and get started!